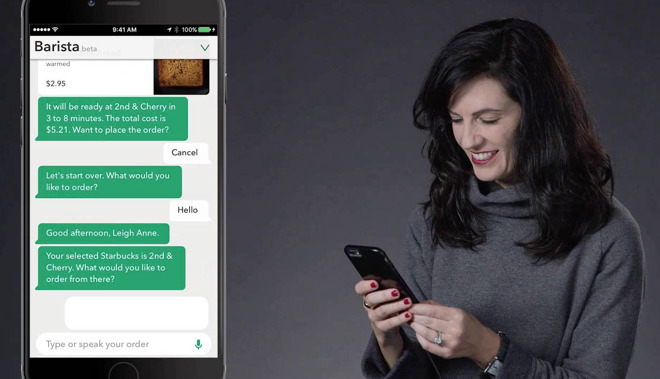 Starbucks is allowing its customers to request drinks by voice using its iOS app, with the My Starbucks Barista digital assistant able to verbally accept coffee orders and confirm payment, before dispatching the order to the nearest store. Said to be using "groundbreaking Artificial Intelligence," the virtual barista can accept commands both verbally and in text, using a messaging app-style interface. Multiple items can be requested in the order at the same time, with individual items displayed with prices and a final order total. The barista will ask follow-up questions if parts of the order need to be clarified, such as the size of a drink. More complex orders can be made in a single statement, with a demonstration showing the app accepting an order for a "Double upside down macchiato half decaf with room and a splash of cream, in a grande cup" successfully. The iOS app is not the only way to verbally order from Starbucks from a device. The coffee chain has also announced Amazon's Alexa has support for reordering a customer's "usual" Starbucks order, allowing the Echo to be used for a quick order before the user leaves the house to collect it.